Toni Davey: 40 Years of Drawing. 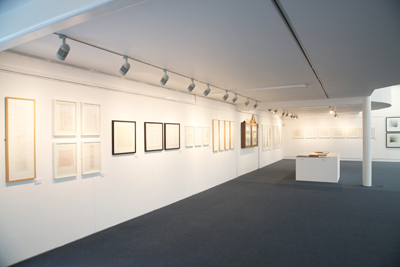 The exhibition comprises work from 1972, mostly drawing in a variety of media: pencil, ink, scored, cut and burnt, from the small and intimate to a very large 3D drawing in wood. As well as approx 120 studio pinboards and studio artifacts. There are 3D pieces that evolve from the drawings and in turn become the subject of the next drawing. The title for the show, 'Taking Control', is taken from a series of recent drawings which developed from repeated questions regarding the ever present use of the underlying grid in my work. As a young child, I would fill in the squares of the Littlewoods and Vernons Football Coupons in sequences of colour and shape using pencil and crayon: the coupons were delivered to all households in the 1950s. The endeavour was a pleasurable escape from a stormy and chaotic childhood into a world of measured calm and order. Another refuge was needlecraft [knitting, crochet, embroidery] especially Fair Isle knitting, inventing and translating on the gridded pattern sheets. I felt that in this aspect of my life, I was 'Taking Control'.